In this exclusive broadcast, Democracy Now! 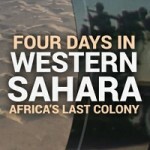 breaks the media blockade and goes to occupied Western Sahara in the northwest of Africa to document the decades-long Sahrawi struggle for freedom and Morocco’s violent crackdown. Morocco has occupied the territory since 1975 in defiance of the United Nations and the international community. Thousands have been tortured, imprisoned, killed and disappeared while resisting the Moroccan occupation. A 1,700-mile wall divides Sahrawis who remain under occupation from those who fled into exile. The international media has largely ignored the occupation—in part because Morocco has routinely blocked journalists from entering Western Sahara. But in late 2016 Democracy Now! managed to get into the Western Saharan city of Laayoune, becoming the first international news team to report from the occupied territory in years.